You can place this Air Freshener hidden camera in plain view of others and it won't be detected. Conduct covert surveillance and monitor customers, employees, and inventory within your business with ease. The Air Freshener Secret Camera is simple to set up, and it's powered by AC outlet just like a normal air freshener does so there are no wires or plugs to contend with. Simply set it up in the room of your choice and begin monitoring. The Air Freshener hidden camera does not function as an air freshener but it is incredibly discreet as as a hidden camera. This covert, hidden air freshener camera unit features motion-activated recording capabilities that begin as soon as movement is detected. The main benefit with motion-activation recording is that the end user will not have to waste valuable time fast forwarding through hours of insignificant and uneventful recording. This covert unit also features Motion Detection Area Masking. For example, if you have a pet such as a dog or cat, and you don't want that pet to accidentally set off the unit's motion detector sensor, you can enable the unit to mask the lower quarter of the camera's vision field so that it does not detect motion in that specified area. Non Functional Air Freshener Hidden Cameras can be placed it in Baby's room, Nursing Home, or any place to bring fresh air. Or to protect your property and Keep everything under control. At the same time recording every moment into a small SD card. What looks like a regular Air Freshener is actually recording every movement! It s almost impossible to detect this hidden camera disguised as a regular looking Air Freshener. The hidden Air Freshener camera features motion-activated recording that begins the second a motion is detected. With motion-activation, you will never have to fast forward through hours of boring footage looking for the action. This covert hidden camera would also make a great hidden camera to place in Basement, Utility Room or even a Bathroom. The night vision model, color camera will automatically switch to a low light camera when it gets dark, though if you need to record in total darkness. This non-functional air freshener hidden camera unit conceals a miniature, self-contained, built-in DVR with an SD card to seamlessly record what the camera sees, completely on-demand! In the meantime, no one within its vicinity will ever guess that this unique, covert camera unit is anything other than a normal, everyday air freshener unit used in homes and offices all across the nation. 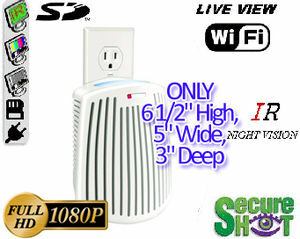 The air freshener, hidden camera, and built-in DVR are all powered solely by the air freshener's power cord. This adds to the illusion that this hidden camera surveillance unit is nothing more than a normal, everyday household or office air freshening device. The next generation of covert security cameras has arrived. Introducing the Air Freshener SecureShot HD-Live View self contained, high definition, self recording system with Wi-Fi Hidden Camera. No need for outdated receivers or extra connections to your PC or router. Live encrypted 1080P high definition video is transmitted to your wireless router enabling live streaming on demand from any authorized PC, Iphone, Ipad or android device. (free app download) Plug and Play P2P automatic connection to your wireless router is simple and quick, no PC expert required! This Small non-working Air Freshener, AC Required and is Available in Color or IR Nightvision.The cameras is tilted 10 degrees upward to insure capture of all live events.